How can you speed up a slow Google Sheet? First off, this is a difficult question to answer because there are so many factors that may or may not be causing you to have a slow Google Sheet. What follows in this article is some suggested optimization strategies and some research into what causes slow Google Sheets. Although we’ve come a long way from those days, if you work with data a lot, chances are you’ll find yourself coming up against slow spreadsheets at some stage. 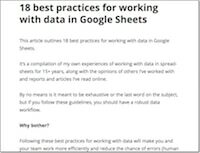 A lot of the tips that follow are generally good spreadsheet practices anyway, so even if you only work with small Sheets at the moment, they’re worth implementing now. If you’re reading this, chances are you’ll recognize some or all of the following issues. Calculations in your Google Sheets are super slow and the dreaded loading bar makes an appearance every time you make a change to your Sheet. Your Google Sheet becomes sluggish to respond to mouse clicks or keystrokes. 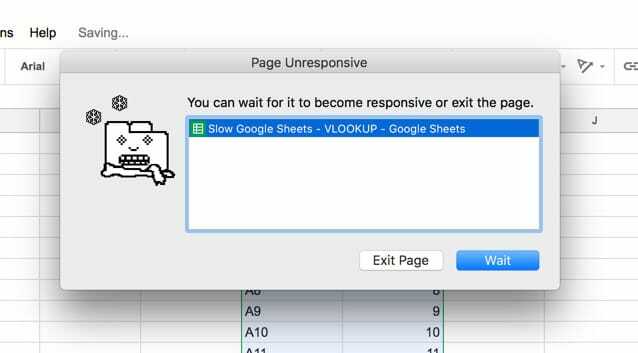 Your Google Sheet becomes unresponsive. This is the worse case scenario, and in my experience, if this doesn’t resolve fairly quickly, you don’t often recover from here. So if you see this error message, and you’ve waited a few minutes but nothing’s happening, then you might want to just bite the bullet, exit the page, and pickup again but trying a different approach this time. This is usually accompanied by your computer going into overdrive with the fan whirring loudly! Obviously if you’re dealing with large Google Sheets — Google Sheets with large amounts of data and/or formulas — then you’re more likely to see your performance suffer. No discussion of slow Google Sheets therefore, would be complete without first discussing the size limits of Google Sheets. Google Sheets has a limit of 5 million cells per workbook (see Google file sizes). Within a single cell, there’s a maximum string length of 50,000 characters (enough for approximately 500 average sentences, or about 162 Tolstoy sentences). You can add a maximum of 40,000 new rows at a time (you can do this as many times as you want though, up to the 5 million cell limit). Using Apps Script, you can quickly build a simple tool to calculate the size of your Sheet. 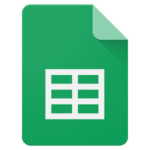 Bonus: Get your own copy of this Google Sheet Audit Tool to measure the size of your Google Sheets. The code for this tool can also be found here on GitHub if you prefer. I’ll do a post in the future looking specifically at how I built this tool with Apps Script. New to Apps Script? Check out my beginner guide to Apps Script. So that’s measuring the size of Google Sheets, what about measuring their speed? 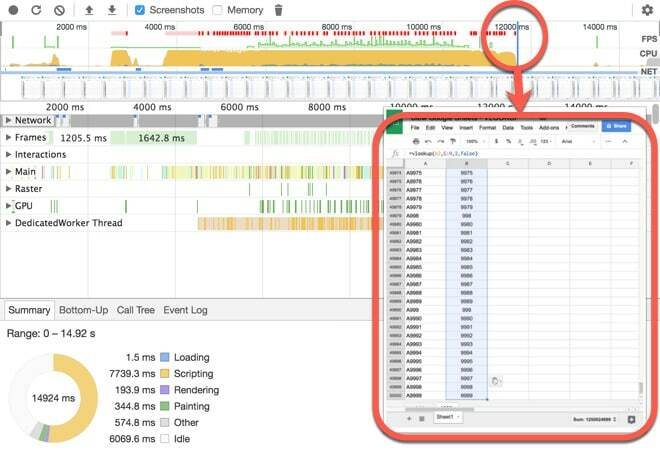 To measure the “speed” of various calculations you can make use of Chrome’s Developer Tools. In your browser window, you can access the Developer Toolkit by pressing Cmd + Option + I on a Mac or Ctrl + Shift + I (on a PC). It can also be accessed in the View > Developer menu. 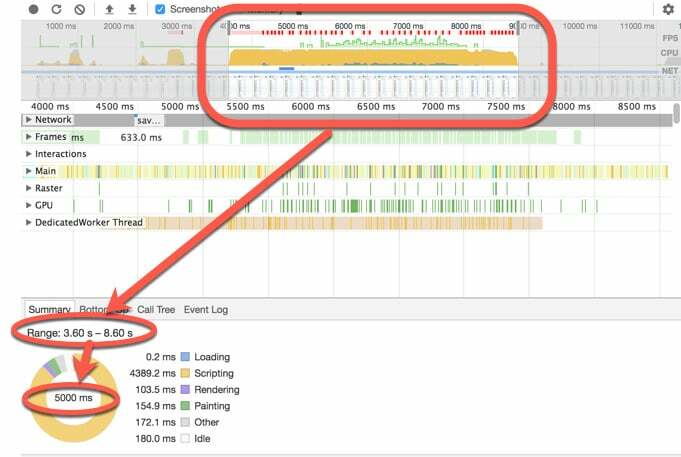 Under the Performance tab of the Developer Tools you can record the webpage (or Google Sheet in this case) as it loads, and check the screenshots box to show you what is happening and when. The number 2 shows a screenshot at this point in time, so you can see that your formulas are not showing yet. Check the screenshot to see that the formula results are showing in the cells now. There’s a whole lot more to the Developer Tools, but that’ll do us for today. This is the methodology I’ve used to calculate formula speeds for comparison tests. I ran all of the tests in the same place at the same time of day (so wifi speed discrepancies were negligible) and also ran them each multiple times and took averages. 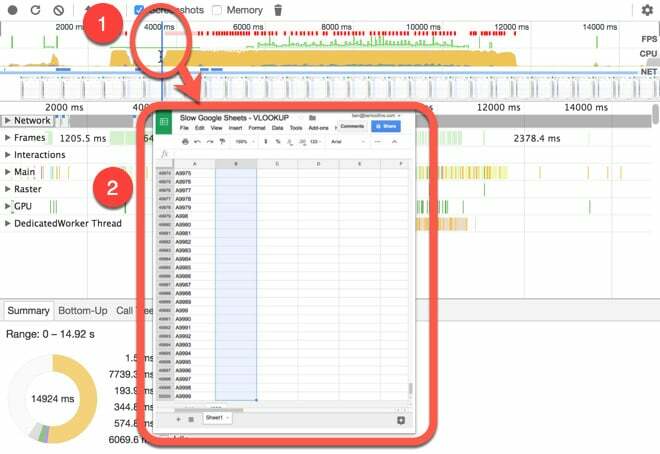 Your Google Sheets will get slower as they get larger. So one of the first things to try, before getting into the marginal gains of formula optimization, is reduce the size of your Google Sheet. Blank cells slow down performance, dramatically so in fact. So it’s a good idea to delete them whenever you can, so you reduce the number of cells Google Sheets is holding in memory. Ideally you should remove any large numbers of blank rows under your datasets, or columns to the right of your datasets. What about new rows being added automatically? Don’t worry if your data is being imported automatically by Apps Script or a third party tool like Supermetrics or Tiller, as the new rows are automatically added to your Sheet as required. Once you’ve used a set of formulas in your data, and you’re sure you won’t need them again, you should convert them to values. This should reduce the file size, which will help performance overall, and it’s also best practice (to reduce errors occurring if someone or something happens to break the formulas). Better yet, learn the keyboard shortcut to save yourself time. Highlight the formulas to change, Ctrl + C on a PC or Cmd + C on a Mac to copy and then Ctrl + Shift + V on a PC or Cmd + Shift + V on a Mac to paste as values. Closed range references means using something like A1:B1000 instead of A:B in your formulas (i.e. you explicitly specify the boundaries of your range). If you’re working with large Sheets and are using open references where you don’t need to, this will be adding extra calculation overhead to your Sheet. Note: Whilst this is generally a good idea for speeding up your formulas, there are obviously situations when an open reference is desirable, for example when new data is anticipated. Leaving an open range will allow any new data to be included in calculations. 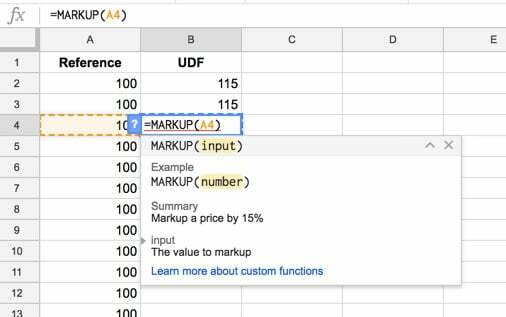 In Google Sheets there are four functions, NOW(), TODAY(), RAND() and RANDBETWEEN(), that are known as volatile functions, which means they recalculate every time there’s a change to the Sheet. All dependent formulas must also be recalculated too (i.e. formulas that reference or include a nested volatile function). This uses up processing power and so can negatively impact your Sheet’s performance, although this is only going to be noticeable if you have large numbers of them. To illustrate, I copied 100,000 TODAY() functions down column A, which took my machine about 5.5 seconds. and then copied this one down. The dollar signs represent absolute references and keep all my formulas locked onto cell A1. Running this formula down 100,000 cells in column A took around 4.1 seconds, so almost 1.5 seconds quicker. It’s also best practice to do this, because if I ever need to make a change to the date, then I can just change it in this one place, A1, and not have to redo all of my formulas. Use closed, rather than open, range references for your search tables where possible (see no. 7 above). Reduce the size of your lookup table, if possible, although this only has a marginal positive affect in my experience. For example, rather than search across everything you might use the Filter function (see no. 17 below) to create a smaller, helper table for the lookup first, and then use that in your VLOOKUP. However, don’t be tempted to nest the FILTER (or other) function inside your VLOOKUP and create the table on the fly each. It’s much, much slower. Combining VLOOKUPs with Array Formulas to return multiple column values with a single lookup is significantly slower than simply using multiple individual VLOOKUPs. In Excel, sorting your data and using approximate matching (TRUE as your final argument in the VLOOKUP) is quite a bit faster than the exact matching algorithm (FALSE as the final argument). It’s slightly quicker in Google Sheets too, but only slightly it seems, so it’s not worth the extra hassle. Another Excel VLOOKUP trick is to use two approximate matching VLOOKUPs instead of a single exact match. It’s significantly faster because the underlying search algorithm is much, much faster. However, I found this technique was actually slightly slower on Google Sheets so I wouldn’t recommend it. The Index-Match is a powerful lookup combination and well worth learning (learn it in day 10 of my free Advanced Formulas 30 Day Challenge course). where you have two nested MATCH functions to lookup the row and column numbers (which is why index-match-match is so flexible). This is fine for small numbers of index-match-match formulas, but inefficient at scale. 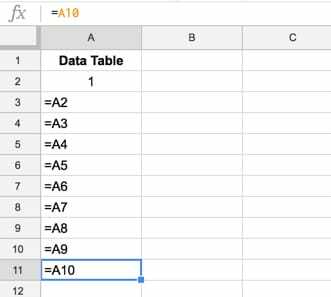 By splitting both the match lookups into their own row and column, you can compute them all once first, and then use those numbers in your index function. Significantly less than before, only about 1/3 as many calculations to do! As alluded to above , using open range references can hurt performance because you may inadvertently include thousands of extra blank rows in your calculations (see no. 7 above). Instead, use closed range references or create smaller helper tables as inputs to your Query functions to speed up performance. For example, running tests with a QUERY function, I found that each additional 20,000 empty rows I was including with open ranges would add 1 second to the calculations. This improves the Query function speed because the calculation is no longer including all of the blank rows in Sheet 2 under the dataset. If you spend long enough reading help forums you’ll find people saying that using a single array formula to replace hundreds of individual formulas will be quicker, and others staunchly saying the opposite. So which is it? In my experience, array formulas working on big datasets (those with lots of rows) are slow and will make your Sheet sluggish. I’ve found they tend to be slower than the individual formulas. However, they’re so useful in specific situations, like gathering Google Form data, that I still recommend learning about them and using them, with caution. I use them heavily for performing running calculations on datasets that grow over time (new rows being added). That way I know the calculation happens without me needing to update anything. will automatically compute a value for every new row of data added. I would test both versions on your own sheets, and choose whichever is most appropriate (weigh up speed versus array benefits of automatic calculation). The individual formula approach has the added benefit of being easier to debug and setup. If you want to keep array formulas (and I hear ya!) consider archiving historic data periodically (see no. 21 below), to keep the live dataset manageable. The ImportHtml, ImportFeed, ImportData, ImportXml and ImportRange formulas pull data from sources external to your Google Sheet, so they require an Internet connection to function. They’re slower than other functions that operate entirely within your single Sheet, so they will potentially affect the performance of your Sheet. The IMPORTRANGE is a slow formula because it’s connecting to another Sheet to retrieve data. In general, it’s best to minimize the number of these external calls required. However, when your data starts to get really big (around 20,000 rows), the IMPORTRANGE formula will just get stuck at the Error Loading data... stage. In this case, use multiple ImportRange calls to retrieve your data. 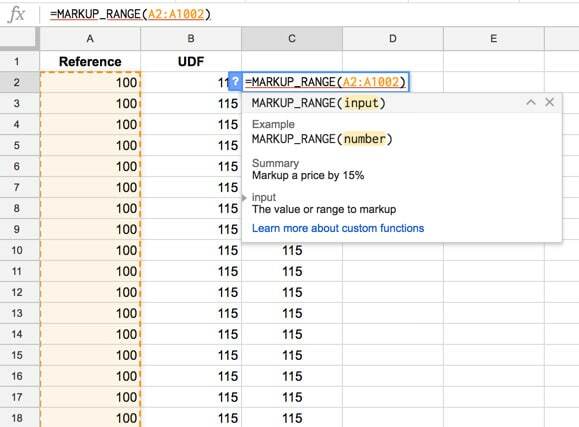 Note, you’re limited to a maximum of 50 of ImportData functions in a single spreadsheet (link). None of the other Import formulas have an explicit limit like this on their help pages and some limited testing suggests that if there are any limits, they’re certainly greater than 50. The GoogleFinance function is another function that retrieves data from an external source, so requires an internet connection. Like the Import formulas above, it will be slower than regular functions operating inside your Sheet only. Again, the general strategy here is to reduce the number of external calls you make with GoogleFinance function, i.e reduce the number of GoogleFinance functions you use. So think about retrieving a whole year of stock prices with a single formula, rather than hundreds of daily functions for example. Per the documentation, GoogleFinance data may be delayed up to 20 minutes. You can use an IF wrapper to check whether a calculation needs to be performed before doing it. Say for example you have a table of product data that includes books, and you want to use a vlookup to bring in book sales data alongside each book. So you set your VLOOKUP up to search for the ISBN number (the book’s serial number) in the sales data table and return the sales value. The inefficiency comes because you’re searching for all your products, not just books, so all those products that have N/a in the ISBN column are still be searched for. Instead, check first for the ISBN number and then only perform the lookup if you have a valid ISBN. Use a control switch cell with the IF statement method from above, to keep things manageable. Use data validation to create a drop-down menu in a single cell, the control cell, with values “Process” and “On Hold” (or whatever makes sense for you). The Filter, Unique and Array_Constrain functions all accept ranges (tables) as inputs and return ranges (tables) as outputs, that are smaller than the input tables. Thus they are useful to create helper tables for further data analysis work. Say you had a table with 100,000 rows of data in, but were only interested in performing calculations on a subset of that data, then you could use one or more of these functions to reduce the size of your table and create a new helper table for your calculations. I created a column with 100,000 copies of this formula, referencing the cell above, and it was NEVER able to show all of the formula answers, even though the underlying formulas were showing in the cells. I had to close the file, wait a moment and re-open to see the completed results. It’s slow and may not even complete the calculation under certain conditions. Aside from that, it’s also very bad practice to chain calculations like this. One error will cascade through the entire chain and it’s also difficult to debug. A better practice would be to reference a single cell with absolute references and then copy that down your column, e.g. Referencing data in the same sheet keeps things simple — always a good practice — and saves time because your formulas can access the data more quickly. Obviously it’s not always practical or convenient to reference data in the same tab of your Google Sheet, but keeping references within your one file will be quicker than using IMPORTRANGE to bring in data form other Google Sheet files. That said, below I discuss the pros of splitting up large, slow Google Sheets (see no. 21 below) and using IMPORTRANGE to bring them back together as necessary. Tempting as it is to create clever formulas that do everything in one go, there are many advantages to creating helper columns. Not only are they easier to create, they’re easier to follow (for you and colleagues), easier to debug, and they can even be faster sometimes too. Suppose you have a list of a website’s URLs in column A and you want to quickly extract the path, the part of the URL after the www.website.com address. Now, since the hostname is the same in each case in this example, we’re needlessly calculating the nested SEARCH function every time. First of all, it may be time to consider warehousing your data in a proper database and not Google Sheets if you are getting close to that 5 million limit (see no. 27 below). This technique should be approached with CAUTION though, to avoid data loss. Only do this if you’re confident you know what you’re doing and you’re sure you really need to. Be aware that this approach comes with a cost also. Before you had one single table to keep track of, to modify, update and analyze, whereas now, if you split it up, you’ll need to keep track of multiple Sheets and ensure that changes and analysis are consistent. A safe bet for this approach might be to offload prior years of data say, or old products that are no longer in your inventory. In other words, it’s data we don’t envisage using again, but that we want to keep a copy of. Conditional formatting is a super nice feature for adding extra context to your Google Sheets, for example highlighting outliers or values above thresholds. I use a lot in my scheduling sheets to highlight the row for the current day for example. However, it can be very slow on large datasets because it’s implemented on a cell-by-cell basis. So it’s best used for small data tables and in your presentation tables and dashboard reports. The possibilities here are extremely broad, encompassing everything from automating repetitive processes to speed up your workflow to creating custom functions to save you typing out complex formulas over and over (see next section). 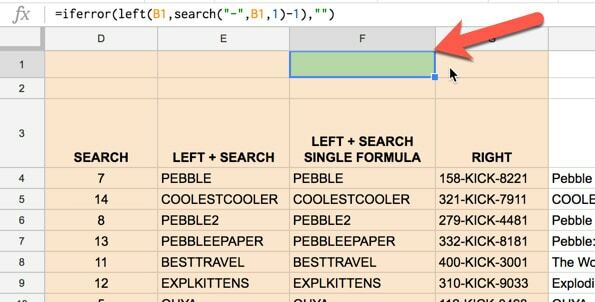 This took about 6.5s to compute for 100,000 rows, and about another 30s to copy and paste as values (another best practice for optimizing your slow Google Sheets – see no. 6 above). Replacing this with Apps Script and running for the same data range took around 16s to paste in all 100,000 values, so less than half the time. Optimizing your Apps Script code is an entirely different and gigantic topic in its own right, so I won’t make any comments in this article. Note however, the current quotas and limitations applied to Apps Script code. Custom formulas, also known as user defined functions, or UDFs, are custom functions written in the Apps Script script editor window. Complex custom formulas will be very slow if you approach them in the traditional function way, and read/write single cells at a time. * @return The input multiplied by 1.15. Copying and pasting this down 1,000 rows is SUPER slow. It took me about 10 seconds, but it’s also dependent on your wifi connection. What you need to do with custom formulas, to improve their performance, is think more like array formulas. The slow part of these formulas is the reading from, and writing to, the Sheet, as this happens via the spreadsheet API, so it’s dependent on your wifi connection. It’s best to minimize the number of read/write calls to your Sheet if you can. Say you want to perform a calculation on 10,000 cells, then you’ll be better off reading all 10k cells into your function once, performing the calculation and then outputting back to your Sheet in one go, as a range. Note: Custom apps script formulas are recalculated only when their arguments change. Also, these arguments must be deterministic, i.e. not one of the volatile functions like NOW() or RAND(). If your custom function tries to return a value based on one of these, it will display Loading... indefinitely. Read more about custom function optimization on the Google documentation. > Close and re-open the Google Sheet (sometimes it’s the simplest fixes that work). > Clear your cache and cookies. > Try another browser or operating system. Make sure both browser and operating system are currently running on their latest version. > Disable browser plugins or extensions. > If possible, try replicating the issue on another computer to see if it’s the computer hardware having issues. A Google Sheet’s calculation speed depends mostly on the local resources. > Try replicating your issue on another wifi network to see if it is a network issue. Most functions are run locally in the browser but some, like the IMPORT formulas, require access to the Internet (as well as any Apps Script which is run on Google servers). > Try disabling and re-enabling offline access. Remember that if you’re working in real-time with other collaborators, changes can take a few moments to synchronize. Other users and any apps script files will be seeing a cached version of the Sheet until all the synchronization operations are completed, and this may affect how certain cells appear. For example, they may well have finished calculating in your Sheet but still be showing blank or #N/A in the view a collaborator sees. Just something to keep in mind, and honestly, it’s a very minor point. In my experience it all happens so quickly that it does feel almost instantaneous, although again really large, slow Google Sheets will suffer from this more. There will come a time, and perhaps you’re already there, when you have to admit defeat and accept that Google Sheets won’t fulfill all of your data needs. For all of it’s strengths, of which there are many, that 5 million cell limit fills up pretty quickly with real-world data. Well before any of your production Sheets approach the 5 million limit you should think through the next steps beyond slow Google Sheets. You’re going to want to move your data into a database archive. You can still work in a Sheets environment but offload the data storage to a dedicated database. Look out for more resources on these topics later this year. I’ve tried to make this post as exhaustive and as useful as possible, but I’m absolutely sure there are more ideas out there. I welcome any comments and thoughts on this topic. Think of this post as a living, breathing article to which more will hopefully be added in the future. Thanks for reading and I hope the insights contained herein have been valuable! Great stuff Ben, thank you! Will refer to this article often, both for my own sheets, and in support of users on the Sheets Help Forum. That “Toggle” idea btw is great. I’ve got a sheet on which, in addition to a the primary duties the sheet performs, there are many tabs that show reports that are only occasionally needed. Since these reports Query or Filter the entire database, I don’t want them running in the background when the user is not even looking. I put a giant ON (in green) / OFF (in red) switch cell at the top of the report, keeping them deactivated when not in use. Lots to think about here, and I’m going to flip through the structure of my sheets looking for opportunities to apply these ideas. Great stuff Ben! Brilliant! A very timely article as I attempt to speed up my unwieldy sales tracking spreadsheet. Lots of great ideas to implement! Thank you Ben, super useful and very helpful information. This post will certainly be part of my “G Sheets how-to reference manual”. Keep up the great work , looking forward to seeing more advanced Google Script how-to´s and courses! Thanx for such an exhaustive article. I was indeed looking for such article for some time. Just a question: Somewhere I read that there is a limitation of number of formula cells to 40,000. I am already have a sheet having more than this so this limit is definitely not correct. But is there actally any limit on the number of formula cells or the only limit is overall number of cells limited to 2 million? Further is there any script that removes unwanted rows and columns from the sheet? You could quite easily write a small script to do it yourself too. You’d need to calculate the max rows and the last row with content and then delete those rows. As you said in the article, I have also observed that normal formulas are speedier than array formulas but then formulas need to be copied every time new rows are added. To reduce the work I have developed a small script which adds row and then copies the formulas formulas in the new rows. But for each sheet I have to make changes in the script to remove the values from non-formula cells depending on the requirement. I have not been not able to develop any generic formula that can be used in different sheets. Can you suggest some way to copy only from formula cells or copy all but then remove values from all non-formula cells. Now, i can easily speed up my google sheet and my productivity also. Thank you Ben, that’s an awesome post, coming right on time, and tips which are not in many other places. What would you recommend for hardware to make the sheets calculate as fast as possible. An i7 K series processor? or xeon? have you tried different hardware? Once again, trying to get a copy of Google Sheet Audit Tool. But the link download never sent to my email. Also for another similar link in this website since along time ago. I always end up for giving up when face situation like this in this website. If you really want to share, why you make it more difficult? or do you actually just want to grab other people email only or do you just want to attract people to visit your site? Sorry you never received the template email (maybe in your Spam folder?). I just tested the link and download email and it’s appears to be working fine. Have sent you the template email directly in any case! Thank you for your sheet link. Now i receive it after you sent it manually. Thanks for this great article. It was very helpful! I’m having an issue with one of the spreadsheets I use. It has a large amount of data, some scripts and IMPORTRANGES, but it’s still usable. What’s the problem: when I edit (add or delete data) from one specific column in one specific sheet, the formula calculation bar starts to load and keep loading for a long time. It also “breaks” the IMPORTRANGE formulas from other spreadsheets that link to this “problematic” spreadsheet. The input data from this column triggers only an VLOOKUP formula in the cell adjacent to it. The are other features in the spreadsheet that are way more complex ant this doesn’t occur when editing them. Have you seen anything like it? Do you have any idea what that might be? Thanks! This is awesome! Is Google Sheets faster with a business G Suite account versus a free personal Google account? I’ve followed the advice in several of the items here, and they did help considerably, but it can still take 10 seconds to recalculate when a user makes a change to a single value on one of the tabs in their spreadsheet. The formulas are very simple. There are no vlookups and no importranges or anything like that. But there are 32 tabs with anywhere from 50 to 300 similar rows. It’s almost as though Google Sheets is recalculating all 32 tabs when it isn’t necessary. Is there a way of toggling autocalculate on and off? Perhaps there’s an add-in that will turn off autocalculate and let users recalculate on demand. I don’t know what to do, but waiting 10 seconds for each simple change is getting to be too much for the people using this sheet. Any further suggestions at this point? great article, however i don’t see much info about how to improve the importxml function. Does-it exist a function which allow us to store the data and not check again and again, maybe juste once a week ? Because i try to check regulary (one a week/month) if links are still on webpage. But it’s so slow on Spreadsheet and sometimes it just fail. Can you backup your claim that array formulas are slower than individual formulas? The strategy used to time the sheet and the actual sheet used, the actual formula used, the number of times, You’ve repeated these tests? I discovered that what was making my worksheet slow was a PivotTable where I processed my entire data table. I removed the PivotTable (which I use exporadically – about once every 2 months), when I need to use it I create a new one at the time of need as it was just to sort the data. This sounds like a permissions issue. You’ll need to ensure the Audit Sheet account has read access to the file you want to check, otherwise you’ll get that error. You can go into your google doc sheet and share it with the same Google account where the audit file is. Is it possible to share that one with you so you can double check? Sure, you can share with me at ben [at] benlcollins.com and I’ll take a look if I can find the time. Done, than you so much. The file name is Financial Resume 6.1. I’ll write inside my email so we can have a direct contact. Great article! Now I understand better a lot of points of the performance of Google sheets. thank your for the great article. Very informative! I have a question. On the office we work a lot with a Google Sheet that has about 5 tabs. Usually 3 of us work on it simultaniously. And others, also on other locoations, have the page open. Sometimes the page gets pretty slow. Does working like that affects the speed of Google Sheets? Excellent article. My problem is strange though. When I type a new formula and hit “Enter” the cell does not show the result until I perform a change in another cell (even though I can see the formula if I leave and come back to the cell). Once I have made a change in another cell….. entering a single character then hitting “Enter” for example, the formula’s result appears in the original cell. Happens on a variety of devices (All Win 10 running Internet Explorer OR Chrome and on any Ethernet/WiFi network). Any thoughts? Thanks for the work on this article. Ben do you know how upgrading your computer will affect Google Sheets, meaning which has a better effect more memory or a faster CPU. Of course help but could you shed any light on the subject. Or is it possible to use getpivotdata on a table that isn’t actually a pivot table? I have some questions related to the loading-times workings of IMPORTRANGE. Lets say I have one “source” file with a large database. does it import everything first and then apply the filter locally, or does it apply the filter and then only import the filtered data? ie, is the importing process faster if it’s filtered? If I have 3 different sheets and import their data into one “source” sheet with from which my employees’ individual sheets import their filtered data. When the individual employee sheets call on the one “combied” source sheet, does it take longer because in the backend it needs to gather from the other 3 source sheets? Or is that all instant in Google’s cloud backend? Great article with a lot of helpful hints! 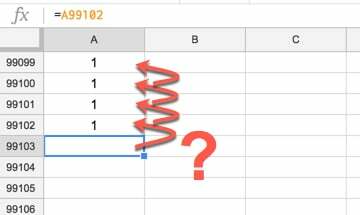 Didn’t know about the ArrayFormula wrapped in the VLookup to return values in multiple cells instead of using multiple VLookup formulas. That is a great discovery! Thank you so much! I know you caution against using ArrayFormulas, but according to the worksheet audit page provided, I am using less than 5% of my available allotment. So any opportunity to program fewer formulas I will jump at! The tool is working fine. It took me some time to understand why it is not running from my end too. You need to open the Script Editor form Tool and then try to run the macro called “sheetAuditor” from menu “Run”. You will be prompted for authorization and once you allow the access to your files the data should load properly. Hello, great article, very helpful. I am now experiencing a delay of 5-10 minutes from the point of form submission (the user hitting SUBMIT) to being viewable in the spreadsheet view. This happens sporadically, but when it happens it can takes 4 or 5 hours. I can not find the cause. I recently “cleaned” the form and the sheet, now are only 350 used rows with 17 columns.